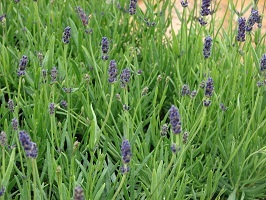 As with most silver-leaf plants, the highly scented lavenders are an excellent choice for dry, free-draining soil, and should do well in sandy or chalky ground. In fact, you should find that chalky conditions actually enhance the fragrance of these evergreen, drought-tolerant plants. It is vital that Lavenders are trimmed every year - in spring or autumn - removing the old flower spikes along with the top inch or two of leafy growth. Without this cut they will invariably becoming leggy and sprawling. We stock a range of both the hardier English lavenders and their showier French cousins. Our lavenders are usually available as both 9cm specimens, priced £2.99, and as larger 2 or 3 litre plants, priced £4.99-£5.99. 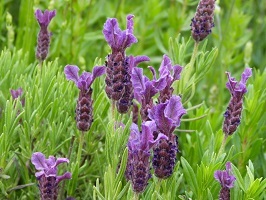 Among some of those you may find on the nursery are the Old English Lavenders (Lavandula angustifolia), including 'Munstead' (height 2ft), 'Hidcote' (2ft), 'Melissa Lilac' (2ft), 'Little Lady' (1.5ft) and the 1ft high 'Lavenite Petite' and 'Elegance Snow'. 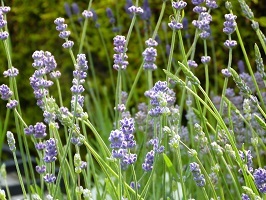 Other popular English lavenders include x intermedia Vera and x intermedia Grosso, both growing to around 2.5ft tall. 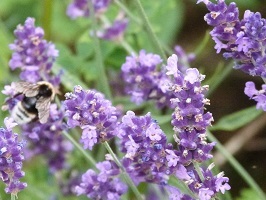 Our French lavenders (Lavandula stoechas) also always sell well. Expect to find 'Fathead', 'Papillon' and 'Rocky Road', which all grow to 2-3ft. If you are looking for a larger quantity of lavender, for example for a hedge, please check with us beforehand so that we can have enough in stock for you.